AweEraser 3.0 was available as a giveaway on September 17, 2018! How would you improve AweEraser 3.0? 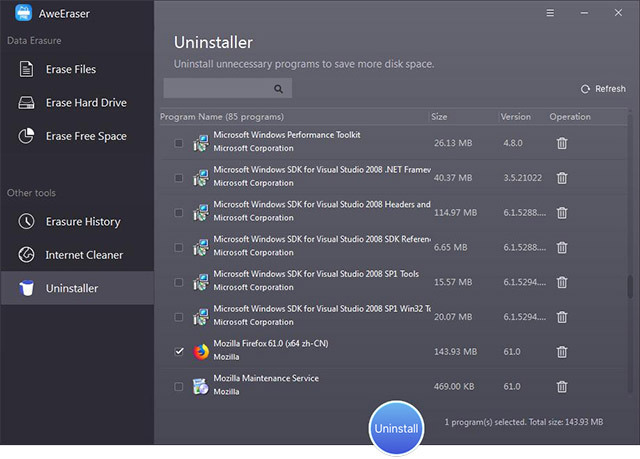 Uninstaller to uninstall unwanted programs and clean up all leftovers. 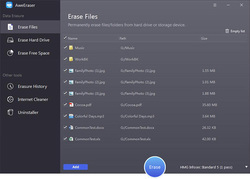 Powerful Mac data eraser to permanently erase data from HDD, SSD, and storage media device. It would be useful if your selling your computer but if I'm dumping my computer due to being too old or not worth fixing then I remove the hard drives. 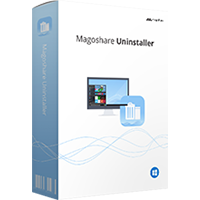 "Magoshare (www.magoshare.com) is a reliable system utility software and data recovery software developer which is established in 2016. Located in Shen Zhen, China, we are a happy and creative team. 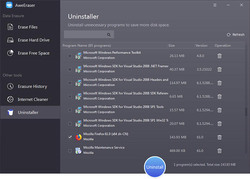 software, uninstaller software and other products service for global users. " Magoshare is not shy of putting himself in the spotlight. The program 'Privazer' is also available and that is free (with a hint to purchase the donor version). Those few people from Magoshare make programs to delete files, but also programs to retrieve files. That is something that pinches, first deleting files and then doing a recovery. Who is being cheated? And that by a company that was founded in 2016. (What month ? ?) 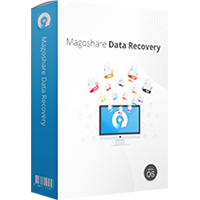 "Magoshare (www.magoshare.com) is a reliable system utility software and data recovery software developer which is established in 2016. Located in Shen Zhen, China, we are a happy and creative team. software, uninstaller software and other products service for global users. " Magoshare is not shy of putting himself in the spotlight. The program 'Privazer' is also available and that is free (with a hint to purchase the donor version). 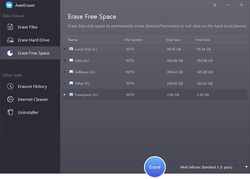 Can someone (some techie, desirable), please, elaborate how secure it is to erase the free space? BUMMER........as #7 below say's>>>>>>>>>>>IT WON'T work on XP.....have XP SP3 and say's NT. I'm ticked as usual for something that "wont work" and the time wasted to mess with it......free or not. BUMMER........as #7 below say's>>>>>>>>>>>IT WON'T work on XP.....have XP SP3 and say's NT. Makes me wonder about Win2000 too if it won't install on XP........... I'm ticked as usual for something that "wont work" and the time wasted to mess with it......free or not. Please mention an freeware program, that can mostly the same like PrivaZer..
Hi Bob. Yes, it installed on both of my computers that have Windows 7 Home Pro 64 bit. To Captain Mainwaring: You can indeed wipe a hard drive clean with zero possibility of anyone " restoring it. " When you say " Police labs," Police don't restore hard drive info. That's usually done by BCI....Bureau of Criminal Identification labs. 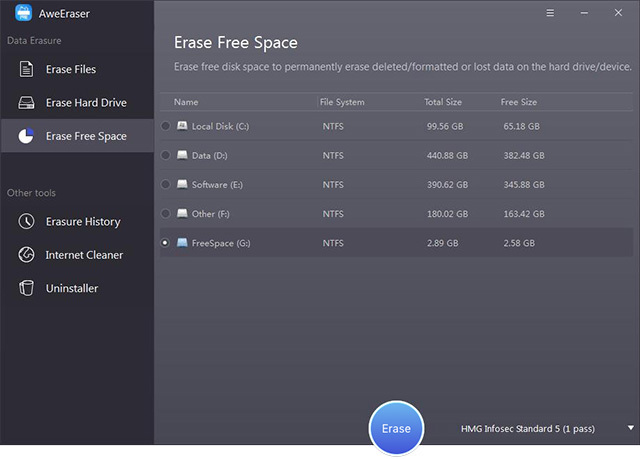 When used properly this program will wipe a hard drive clean with one use. Please don't believe everyone that says that a certain agency restored hard drive info. That would be an untruth. Wiped clean ( properly ) is wiped clean. Deleted, never to come back. Hi Bob. Yes, it installed on both of my computers that have Windows 7 Home Pro 64 bit. To Captain Mainwaring: You can indeed wipe a hard drive clean with zero possibility of anyone " restoring it. " When you say " Police labs," Police don't restore hard drive info. That's usually done by BCI....Bureau of Criminal Identification labs. 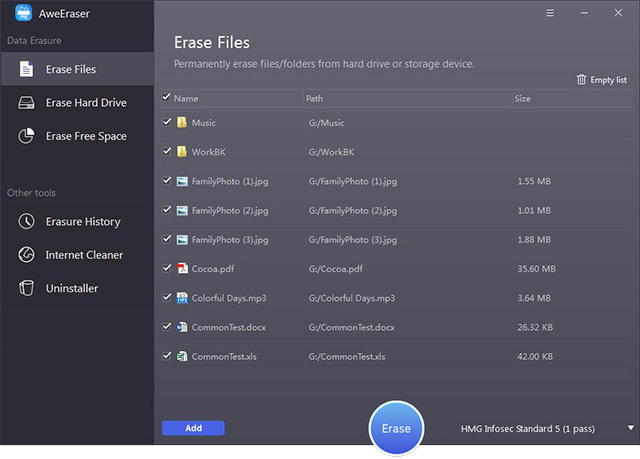 When used properly this program will wipe a hard drive clean with one use. 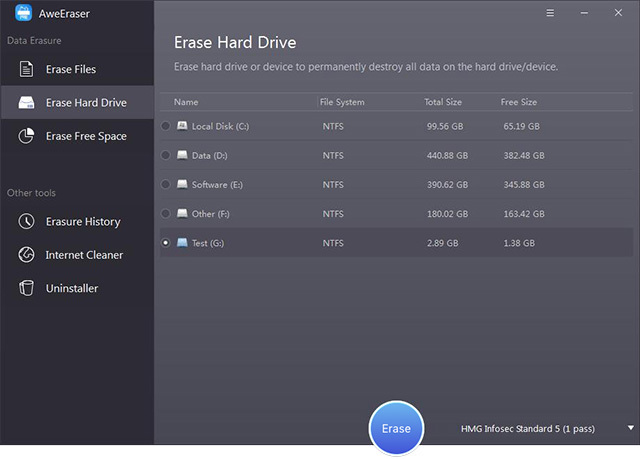 Please don't believe everyone that says that a certain agency restored hard drive info. That would be an untruth. Wiped clean ( properly ) is wiped clean. Deleted, never to come back. Program requirement is Windows XP yet when I try to install a message comes up "Program requires Windows NT version 5.1 Service Pack 4 or later". What is wrong here? I have Windows XP 32 bit and am able to install all programs for "Windows XP". The utility comes with a modern and intuitive interface designed as a dashboard for simpler and faster navigation. Therefore, while in the left you can access the functions, the right tab is where you can preview, select and delete the data. The tool enables you to permanently delete data using the accepted data erasure standards, including HMG Infosec, U.S. Army AR380-1, DOD 5220.22-M, German FOFI and Peter Gutmann's algorithm. i'm surprised that you don't have a number of the Win Pro system that you use. will this install ok on a win 7 pro system? Scott, i'm surprised that you don't have a number of the Win Pro system that you use. will this install ok on a win 7 pro system? Yes, there is an area in "yellow" to click to "activate" after inserting the number. If I remember correctly, it was underneath the number and to the right. I had no problems and I now have the full version and not a trial. Alaa Hegazy, Yes, there is an area in "yellow" to click to "activate" after inserting the number. If I remember correctly, it was underneath the number and to the right. I had no problems and I now have the full version and not a trial. I have the same problem as Alaa. There is no "Activate" button on my screen. I even tried to use the Tab button hoping that it was hidden, but the prompt wouldn't advance. I'm using a Surface and when I open the program, it is tiny on my screen. I had this same issue when trying to use Quicken on this machine. Anyone have any thoughts? Alaa Hegazy, I can't even find where to put the reg key? Mardel, I do not have the yellow box on mine to click activate to enter the code? Alaa Hegazy, You could try to download and install the software from the site of the developer. If that's done, install the software from GOTD again. Hopefully there is now an activation-button. I noticed, that your screen-dump is a little bit different form min, beside the button. The lines are different height, place . Alaa Hegazy, You could try to download and install the software from the site of the developer. If that's done, install the software from GOTD again. Hopefully there is now an activation-button. I noticed, that your screen-dump is a little bit different form min, beside the button. The lines are different height, place . Bruce Baxter, What free alternative? Don't understand your question as this is a give away today! No time limits. By the time you think you need an upgrade, one will probably be offered. Bruce Baxter, Don't understand your question as this is a give away today! No time limits. By the time you think you need an upgrade, one will probably be offered. Peter, Try AxCrypt and there are others, just Google it! Bruce Baxter, Name it ! this software is free. the clue is in the name giveawayoftheday. Bruce Baxter, this software is free. the clue is in the name giveawayoftheday. Paragon, Yes and a number of those were GOTD before such as Glary Utilities, Ashampoo Win Optimizer, Wise Care 365 etc. I did notice that they forgot my go to when selling a drive, Active@ Kill Disk. That being said, I shall install and try on a few drives that are no longer needed and report back. Paragon, Yes and a number of those were GOTD before such as Glary Utilities, Ashampoo Win Optimizer, Wise Care 365 etc. I did notice that they forgot my go to when selling a drive, Active@ Kill Disk. That being said, I shall install and try on a few drives that are no longer needed and report back.